I love rock climbing, and I love writing about it. Today I thought I’d draw your attention to, if you don’t already know, a really extreme rock climber – CHRIS SHARMA. Sharma started rock climbing when he was 12 years old. At age 14 he won the Bouldering nationals. 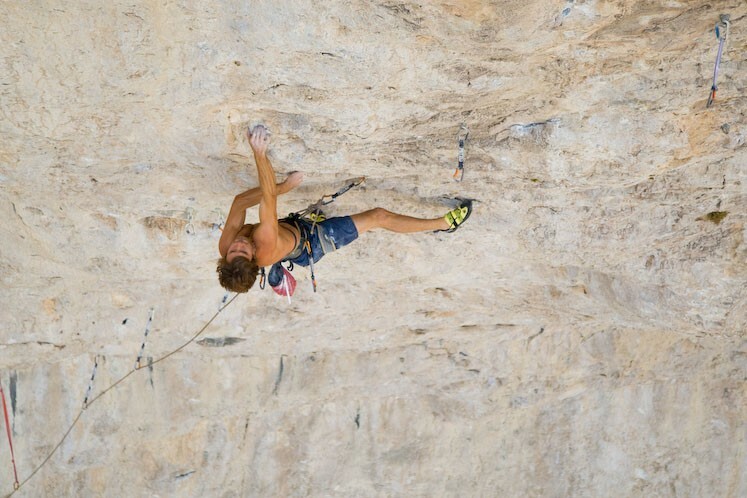 A year later, he completed a 5.14c climb, which was the highest-rated climb in the American rating system at the time. He has since established or completed a few routes thought to be 5.15, including La Rambla and Es Pontas (a deep water soloing project in Mallorca). 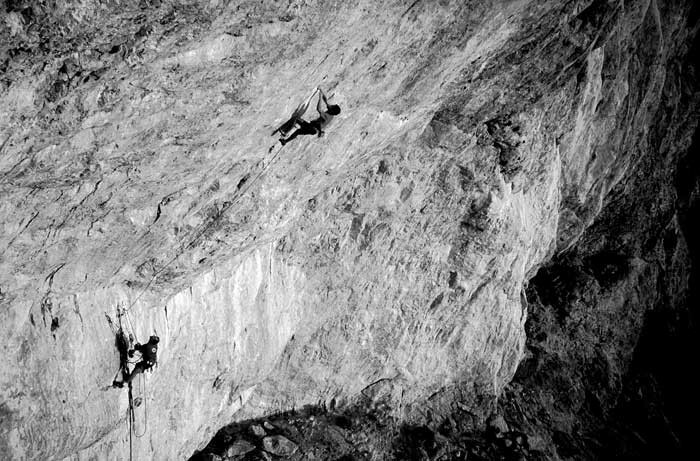 In 2008 Sharma climbed the 250 ft line, Jumbo Love, at Clark Mountain in California, claiming 5.15b for the grade. He has just completed a new 9a+/5.15a project in Oliana, Spain called Pachamama. Picking projects at your physical and mental limits means constant exposure to the reality of failure. But failure is a word that has no place in Sharma’s vocabulary. In professional climbing talent burns hot and fast and a decade is a long time. The physical damage to the body can be huge – ankles snap, shoulders pop from sockets and fingers calcify. And if nagging injuries weren’t enough, climbers often falter beneath the mental pressure. But not Chris Sharma. At 26, he is an athlete endowed with unparalleled physical strength and mental tenacity, dominating world sport climbing and bouldering for the last dozen years. Funny video this from SaasssLove, though my heart goes out to poor Steve! Here’s another climbing site admirably suited to our extreme sports blog, Clark Mountain, 40 miles south of Las Vegas and 235 miles from downtown Los Angeles. The climbing here is about 300-500 feet high and about a mile long. Clark Mountain is the high point of Mojave National Preserve and is a refreshing climb out of the desert. It is sport climbing in an alpine environment. Geologically speaking, Clark is part of a long chain of limestone outcroppings that stretch through the Great Basin from Nevada and Utah into Wyoming and Montana. This is Third Tier – “the most amazing wall in the USA” says Joey Kinder. Sheer white limestone for hundreds of feet, but it is hardly developed. Third Tier, also known as The Monastery, has 34 routes including Jumbo Pumping Hate and Tusk. It is some of the best limestone in the country. Randy Leavitt originally opened up this area having scoped it for years from the highway. It took him, with help from Jorge Vissar, Ed Worsman, and Glen Svenson, 4 years to establish over 80 routes in the four areas of Clark Mountain all the while keeping their activities quiet so they could enjoy the solitude and the magnificent climbs before others moved in. Jumbo Pumping Hate, a Randy Leavitt route, is a 5.14a climb. It’s long, involved and really exposed with juggy sequences and dynos. The rock quality is exceptional. Features are not limited to one type. You’ll find it all — pockets, edges, slopers, pinches, underclings, and cracks. The climbing is always interesting. Each route is distinctive. The climbing doesn’t get repetitive or boring. But be careful – help is a long way away. 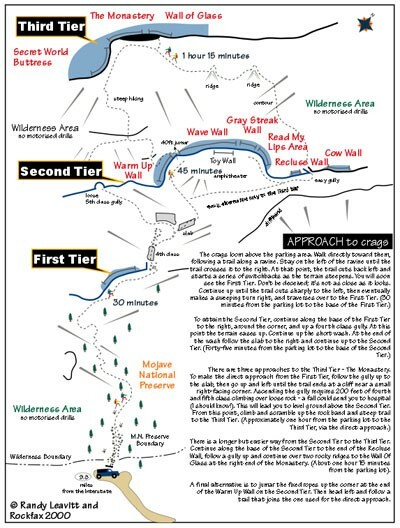 The climbing of Clark Mountain began in 1992 and Hole In The Wall was the first route established on the First Tier. Read My Lips was the first route on the 2nd Tier and Religious Man on the Third Tier or The Monastery. Randy Leavitt and Mike Booth on Jumbo Pumping Hate 5.13d (8b) at the Monastery. The climbing area is 9 miles off Interstate 15 and 5 miles south of the Nevada border. Most of the climbing is on the East Face of Clark Mountain. There is also one developed crag on the South Face known as the Baily Road Crag. Summer is well and truly here, so if you’re a rock climber and looking for somewhere to go, we highly recommend Maple Canyon in Central Utah. It is one of the nation’s most unique rock climbing areas and offers some truly spectacular, and spectacularly extreme, rock climbing. With 140 bolted routes, this is a climber’s mecca. The routes are easily accessed from the road or various hiking trails, and range between 5.4 – 5.14c (Yosemite decimal system) in degree of difficulty. A 60 m rope and 16 draws will be plenty for the area. A guide book is available though sometimes difficult to find. The walls range from less then ten feet high to hundreds of feet, and for those more advanced climbers there are several large over hangs. Something for everyone. This canyon is rated one of the top locations in the world for rock climbing. You always know that a place must be pretty special when climbers from around the world come to test their skills there. But it’s not only the best of the best who climb at Maple Canyon… on any given weekend climbers of all abilities, ranging from novice to expert, can be seen testing their skills. The rock in Maple Canyon is unique. The cliffs are embedded with thousands of cobblestones, or rounded rocks, ranging from the size of a pingpong ball to that of a watermelon. Every cobble will be a different hold and you never know whether it’ll be a crimp, a sloper or a sinker jug. The choice with every move is vast and you will have to feel several cobbles before making your decision. You will require endurance. If you’re confused about my description of the canyon walls, watch this video from toddhambone, which couldn’t give you a more clear idea of the uniqueness of this rock. And if you’ve had your fill of climbing for the day, you can always do some bushwacking, but be careful, these mountains are also filled with Mountain Lion – and remember this is their territory not yours! 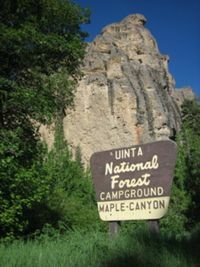 The US Forest Service operates a small campground within the canyon. The amenities are basic and include pit toilets, picnic tables and campfire rings. There are 13 sites for tents or small trailers (no pull-through sites) and they fill up quickly on the weekends in the summer months. The sites are generally well shaded and against the canyon walls. All sites are within walking distance to the climbing areas. You are currently browsing the Extreme Sports blog archives for July, 2009.